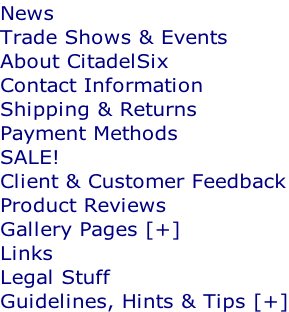 Conquest Games Norman Knights® (see Legal Stuff) plastic miniatures. 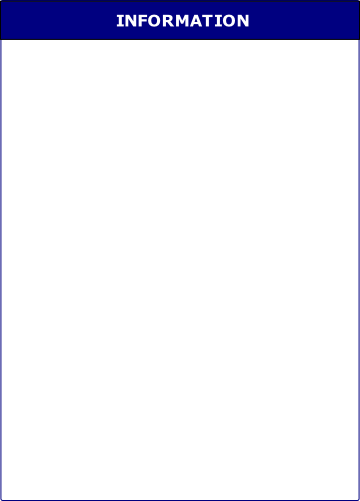 PLEASE NOTE: All decal-sets in this range are printed on CLEAR decal film, and therefore must be applied to either a white-painted or natural metal surface. All sets contain 4 X Circular shields and 5 X Kite shields, with a common background (field) colour. 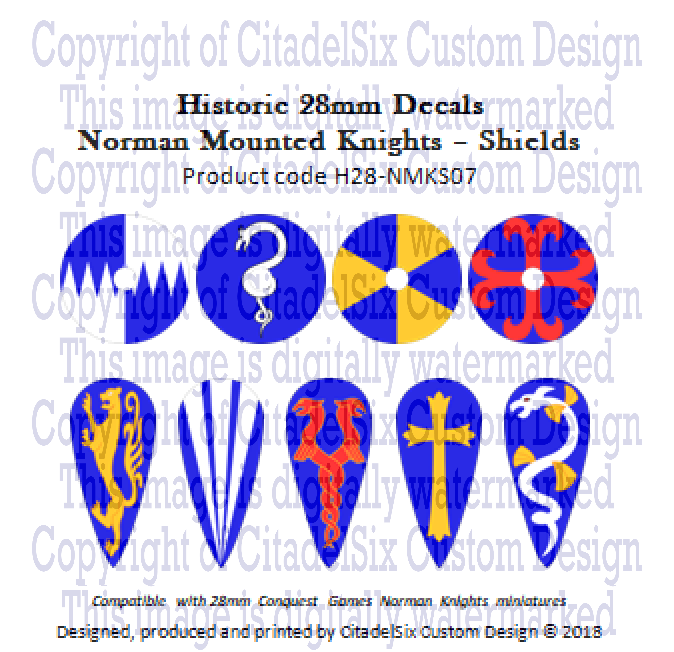 Circular shields: Azure, 1 Cross Pattee Or; 2 Pallets (3) Gules Counter-changed PerFess; 3 Chevron Argent; 4 Serpent Nowed Gules. Kite shields: Azure, 1 Wyvern Reguardant Gules; 2 Pile Or; 3 Wyvern Argent; 4 Bendy Sinister Argent; 5 Wyvern Or. Circular shields: Gules, 1 Saltire Sable; 2 Pallets (3) Or; 3 Serpent Nowed Azure; 4 Escarbuncle Argent. 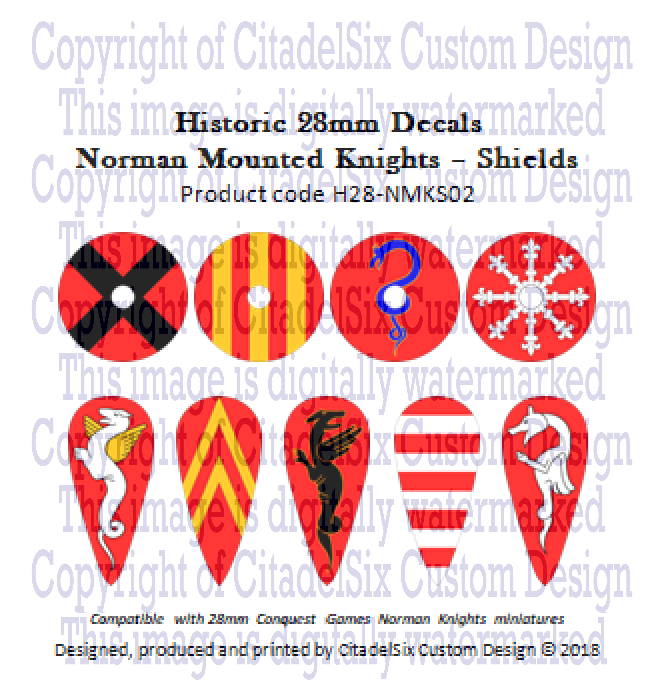 Kite shields: Gules, 1 Wyvern Argent, Wings Disclosed Or; 2 Chevronels (2) Or; 3 Wyvern Reguardant Sable; 4 Barry Argent; 5 Wyvern Argent. Circular shields: Sable, 1 Gyronny (8) Argent; 2 Serpent Nowed Or; 3 Cross Formy Gules; 4 Delve Or. 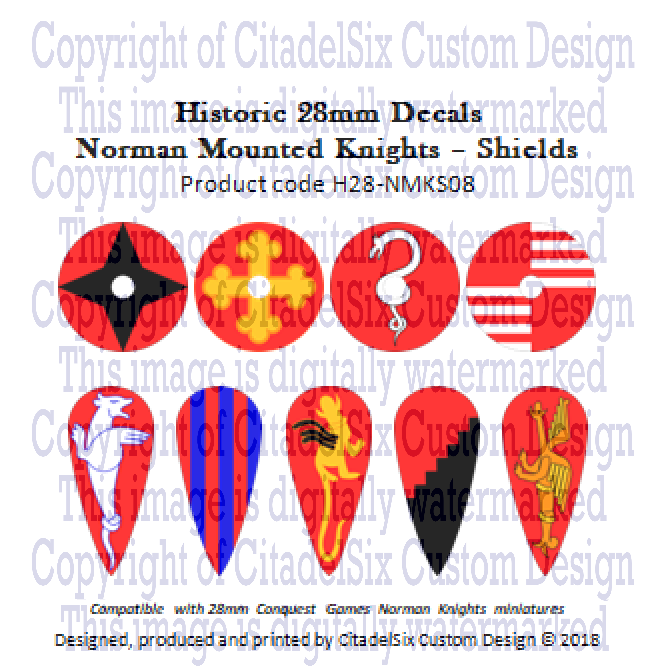 Kite shields: Sable, 1 Wyvern Volant Argent; 2 Indented PerPale Argent; 3 Lion Rampant Orange; 4 Chevronny Gules; 5 Dragon Argent, Winged & Collared Or. Circular shields: Azure, 1 Serpent Nowed Or; 2 Chevronny Orange; 3 Cross Patee Gules; 4 Bars (3) Argent. 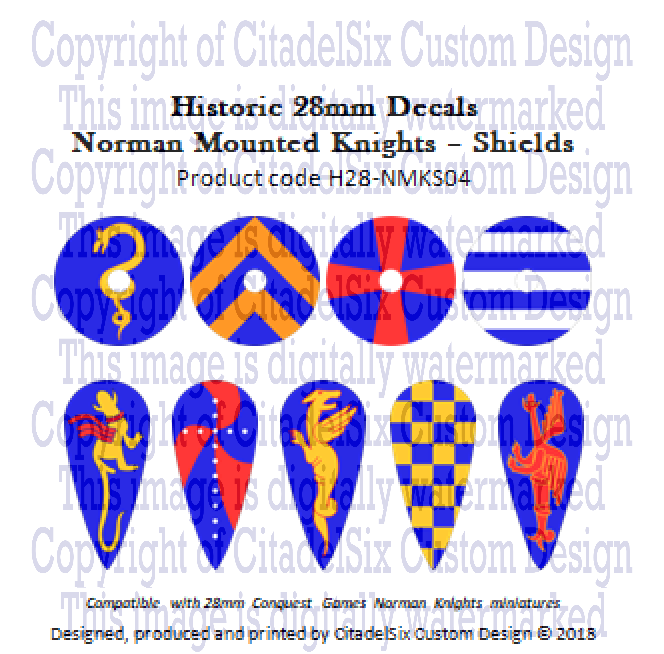 Kite shields: Azure, 1 Dragon Argent, Winged & Collared Gules; 2 Gyronny (6) Gules; 3 Wyvern Reguardant Or; 4 Chequy Or; 5 Wyvern Volant Gules. 3 Fess Dancetty Or; 4 Chequy Sable. 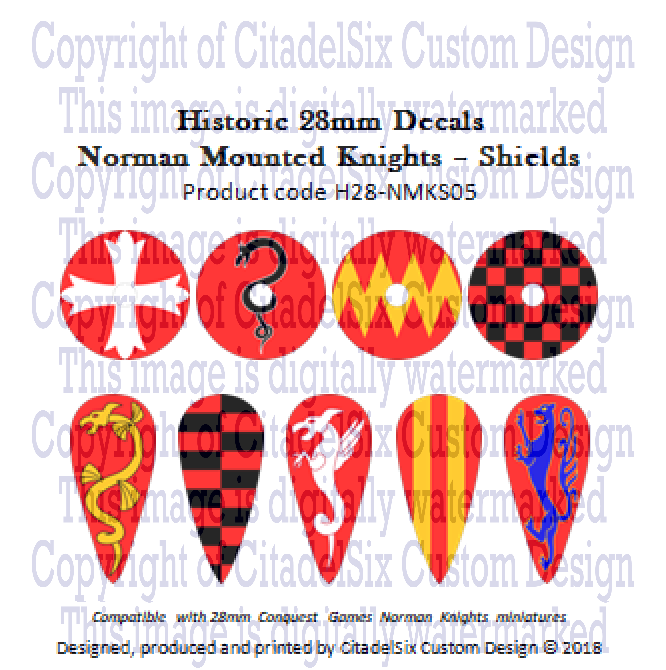 Kite shields: Gules, 1 Sea Serpent Nowed & Finned Or; 2 Barry Sable Counter-changed PerPale; 3 Wyvern Argent; 4 Pallets (2) Or; 5 Lion Rampant Azure. Circular shields: Sable, 1 Cross Potent Quadrate Argent; 2 Bendy Gules Counter-changed PerBend Sinister; 3 Serpent Nowed Argent; 4 Gyronny (6) Orange. 3 Wyvern Reguardant Argent; 4 Lozengy Argent; 5 Wyvern, Wings Disclosed Or. Circular shields: Azure, 1 Quarterly Indented PerFess, 2 & 3 Argent; 2 Serpent Nowed Argent; 3 Gyronny (6) Or; 4 Cross Recercely Gules. 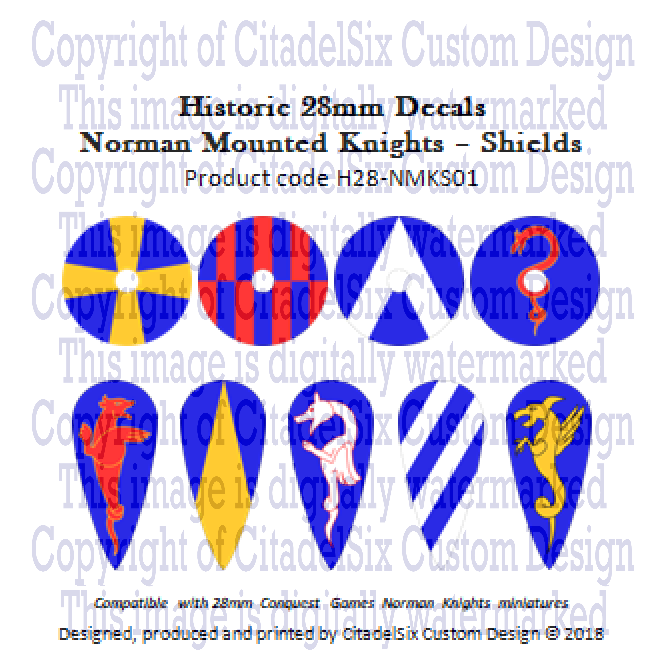 Kite shields: Azure, 1 Lion Rampant Or; 2 Pily-Paly Argent; 3 Serpent & Eagle Addorsed & Entwined Gules; 4 Cross Patonce Extended in Base Or; 5 Sea Serpent Nowed Argent, Finned Or. 3 Serpent Nowed Argent; 4 Quarterly, 2 & 3 Barry Argent. 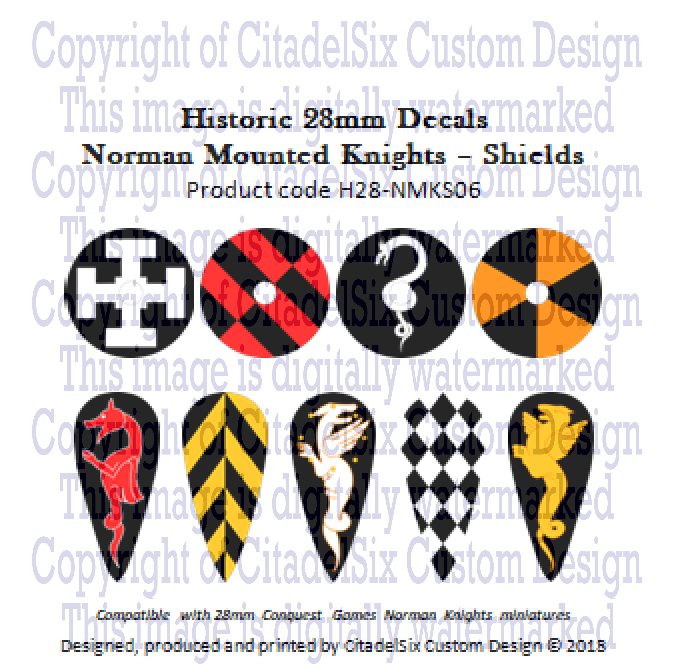 Kite shields: Gules, 1 Wyvern Reguardant Argent; 2 Paly Azure; 3 Dragon Or, Winged Sable; 4 PerBend Indented Sinister Sable; 5 Wyvern Volant Orange. Circular shields: Sable, 1 Gyronny (8) Tennè; 2 Chequy Argent; 3 Cross Engrailed Or; 4 Serpent Nowed Gules. 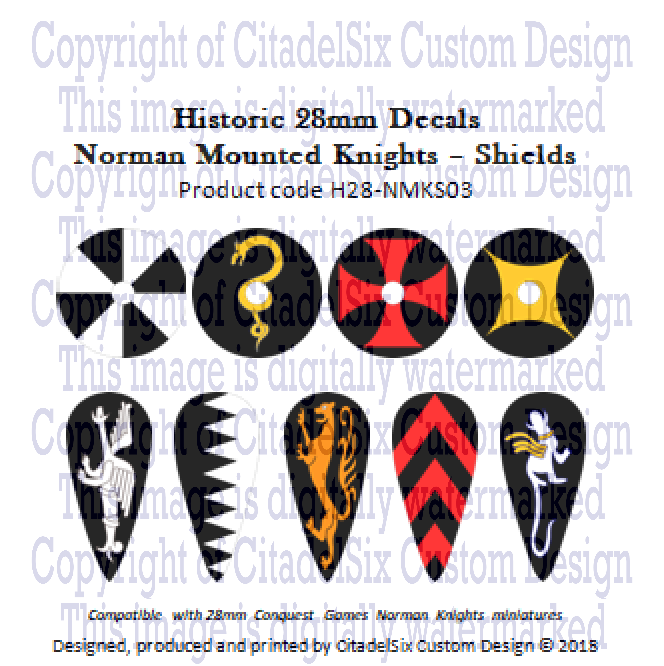 Kite shields: Sable, 1 Sea Serpent Nowed Or, Finned Argent; 2 Indented PerPale Gules; 3 Lion Rampant Argent; 4 Gyronny (8) Or; 5 PerPale Argent, Eagle Or & Dragon Gules Addorsed & Entwined.